This guide will walk you through creating an EMDK For Android application that will use Bluetooth Scanner API introduced in EMDK V 3.1, to perform pairing with Bluetooth Scanning device using Bluetooth Pairing Utility of Bluetooth Scanner API. Note: The Bluetooth Scanner API is a part of Barcode API. 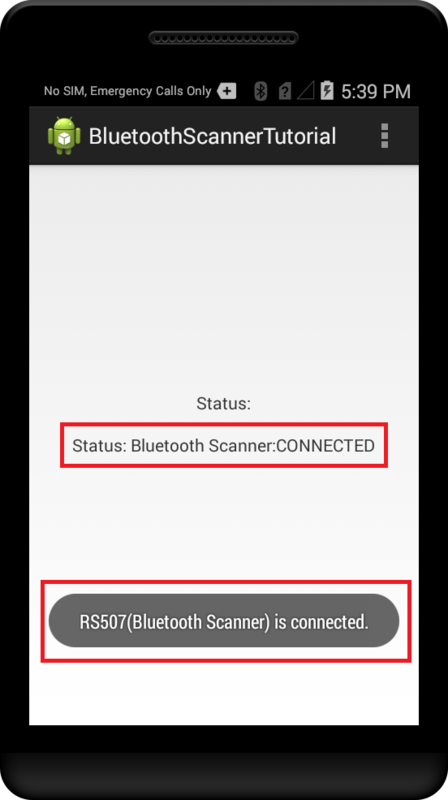 Initially, the Bluetooth Scanner is not connected to the device. 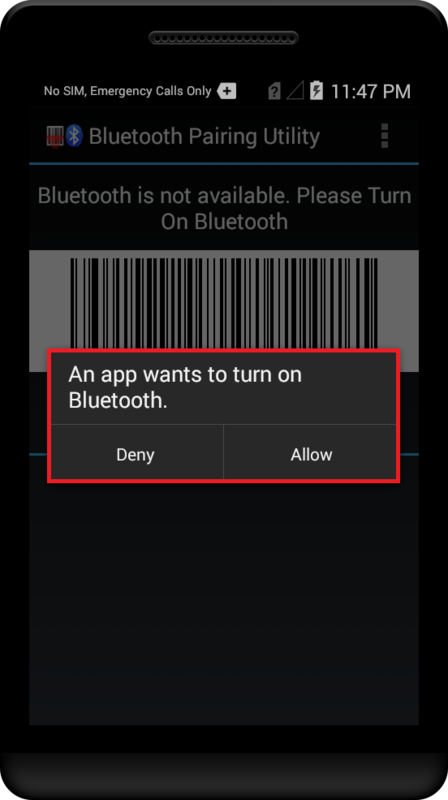 So the Bluetooth Pairing Utility would turn ON the Bluetooth of the device where the app is running (Ex. TC55) if not already turned ON. Once that is done, the utility will ask you to scan a Barcode in the app using Bluetooth Scanner (Ex. RS507). After scanning the Barcode, the utility will start pairing process and pair the Bluetooth Scanning device (Ex. RS507) with your device where the app is running (Ex. TC55). 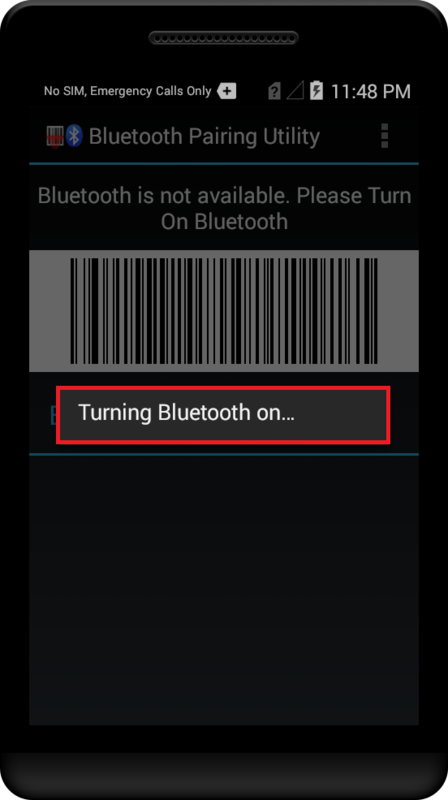 In this tutorial, we will explore the Bluetooth Scanner API by using it for developing a basic application that will pair the device with Bluetooth Scanner by allowing Bluetooth Scanner to scan the Barcode in the app through Bluetooth Pairing Utility. Note: The Bluetooth Scanner API does not use Profile Wizard to pair with Bluetooth Scanner and everything needs to be configured programmatically through code. 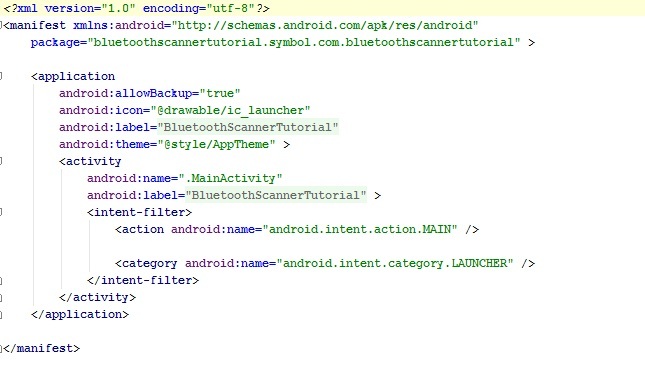 Note: Provide "BluetoothScannerTutorial" as the project name for this tutorial. 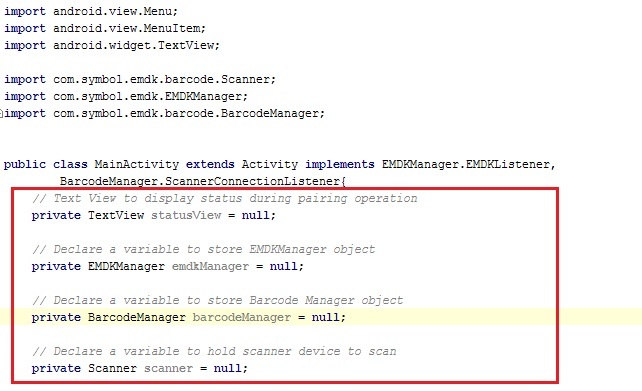 After that you also need to implement BarcodeManager.​ScannerConnectionListener, which is an interface to notify the client when the scanner device (Ex. RS507) has been connected or disconnected to the mobile device (Ex. TC55). Override its onConnectionChange method, which would be called when the scanner gets connected or disconnected to the mobile device. We will now create some global variables to hold the instance objects of EMDKManager and BarcodeManager. These variables would be used throughout the code. We will then add some UI elements, which is just a TextView for notifying intermediate status operations performed during pairing. 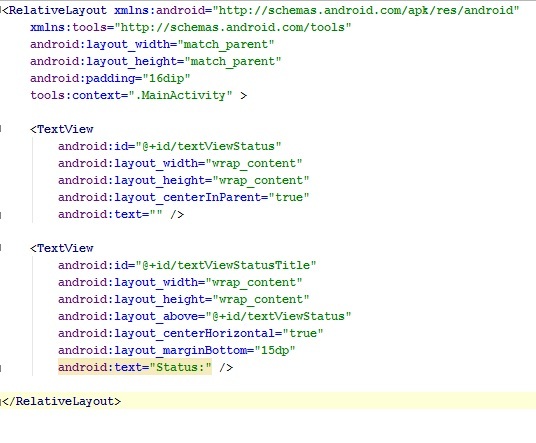 Now, let us design a simple UI that has simply has a TextView to indicate status during pairing operation. 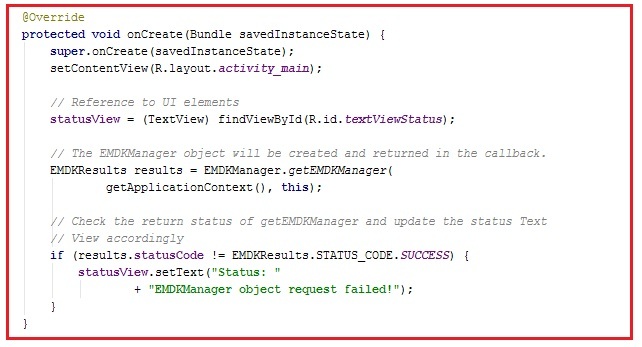 Get the EMDK Manager in the onOpened method, update the StatusView TextView with a message and add the ScannerConnectionListener to get the Connected/Disconnected events between Bluetooth Scanner and Mobile by adding following code in onOpened method. You will see error as we have not added initScanner method for initializing Bluetooth Scanner of our mobile device (Ex TC55). initScanner method gets the number of supported devices in a list. It then iterates through this list of devices and checks one with "Bluetooth Scanner" by refering friendly name. If the list has Bluetooth Scanner device, it initializes Scanner object with Bluetooth Scanner. 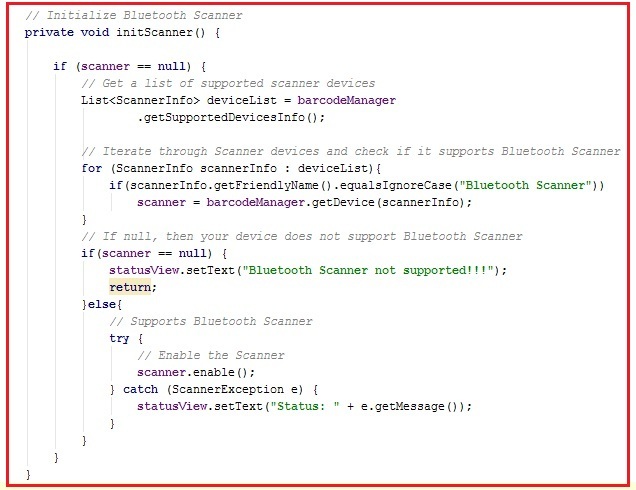 If the Scanner Object is still null after iteration, your device doesn't support Bluetooth Scanner. Finally, we enable the Bluetooth Scanner. Now, we will add a method to de-initialize the Scanner named deInitScanner. This method will perform following operations in the same sequence. Cancel any pending read operations. 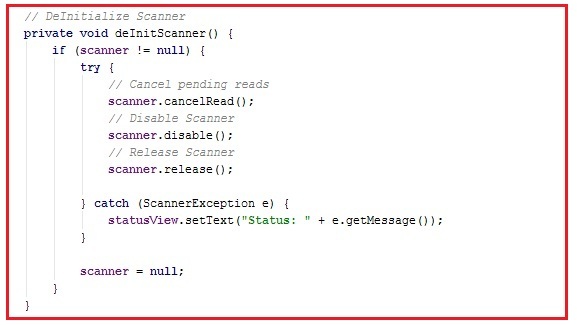 Eventually set the Scanner object to null. Let's add an AsyncTask for asynchronously updating the StatusView. This would be useful in the onConnectionChange callback method that updates the status to Connected/Disconnected depending upon the result. So AsyncStatusUpdate is an AsyncTask that would simply update the Status View with following code. We would now add the code to update statusView in onConnectionChange callback method. This method would be invoked when the scanner device has been connected or disconnected to the mobile device. 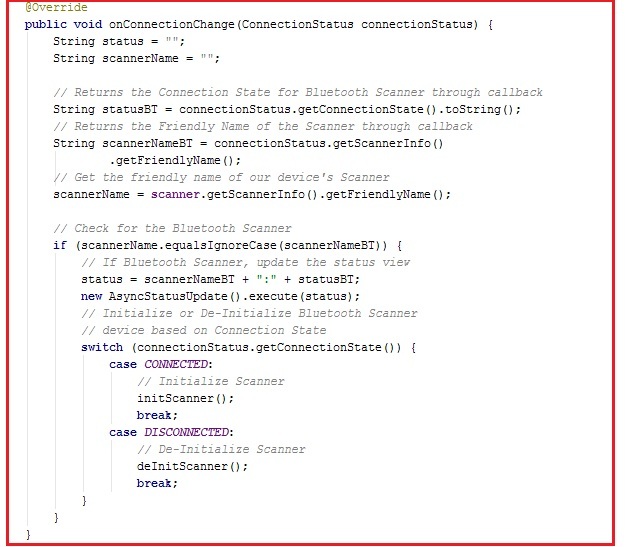 So we will first get the connection state and friendly name of the Scanner device received through onConnectionChange callback method. If the friendly name is "Bluetooth Scanner", then we would update the statusView with the Scanner Name and its state. Later, if the state is CONNECTED, we would invoke initScanner method and deInitScanner method for the DISCONNECTED state. Finally, release all the resources in onClosed method. So it would remove the ScannerConnectionListener and release the EMDKManager using following code. That's it!!! 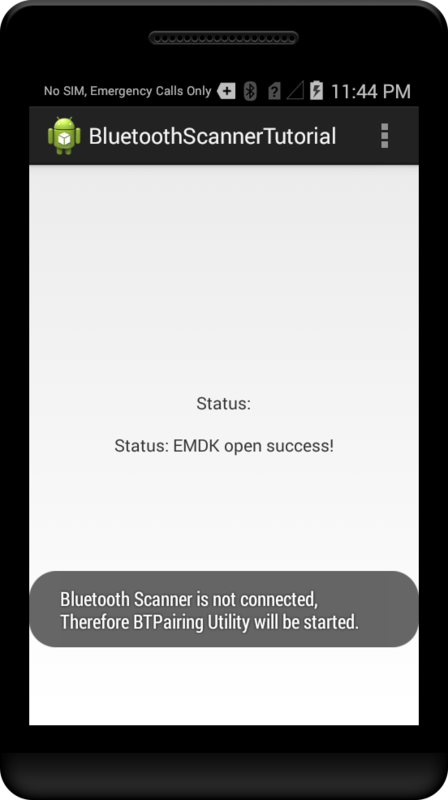 We are done with all the coding part that will let us perform pairing with Bluetooth Scanning device using Bluetooth Pairing Utility of Bluetooth Scanner API introduced in EMDK V 3.1. Now let us run the application. Note: Initially the bluetooth of the device is turned OFF. So it displays a Toast saying bluetooth scanner is not connected, which would start Bluetooth Pairing Utility to pair devices. It will first ask you to enable the Bluetooth of the device. Click "Allow" and the Bluetooth Scanning Utility would turn your device's Bluetooth ON. It would display a screen with a Barcode, which needs to be scanned to pair with this device. 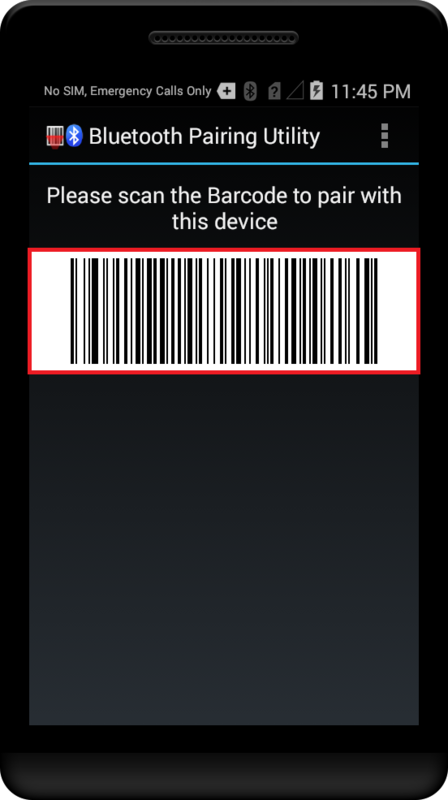 You can take a Bluetooth Scanning device (Ex RS507) and scan the Barcode shown on the screen of your app (App is on TC55) and Bluetooth Scanning Utility would pair these two devices. 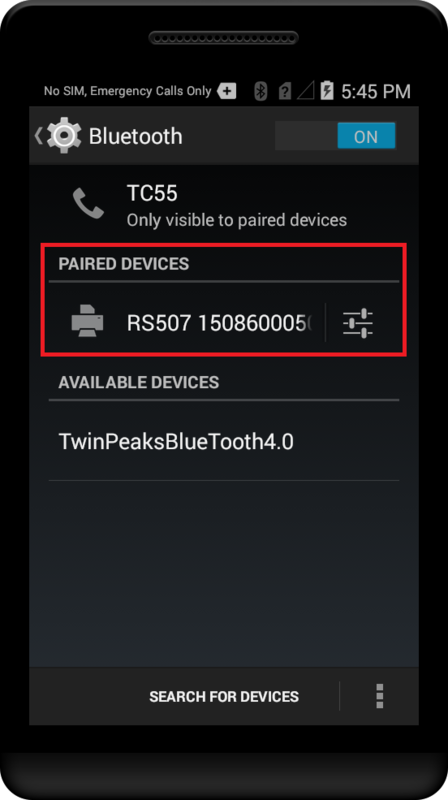 You can see a Toast confirming that the two devices (TC55 & RS507) have been paired and connected to each other along with the updated status on statusView. 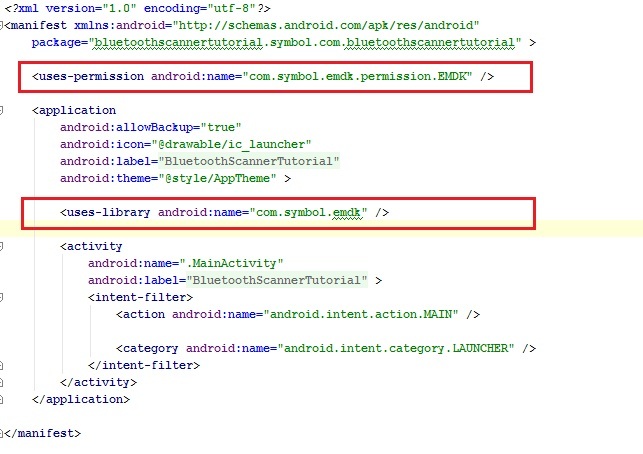 Now, lets check under Bluetooth Settings of the Mobile device (TC55) for further confirmation. So go to device's Settings -> Bluetooth. Now that you have learned how to perform pairing with Bluetooth Scanning device using Bluetooth Pairing Utility of Bluetooth Scanner API, in the next tutorial we would concentrate on ScanAndPair APIs and develop an application to demonstrate its use.